Seasonal Magazine: Are Start-ups & Digital Push Worsening India's Jobs Crisis? 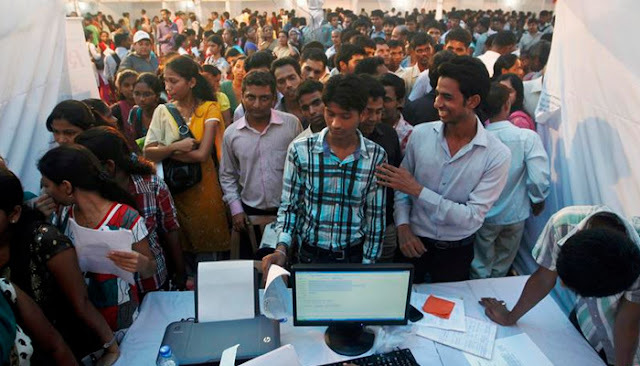 Are Start-ups & Digital Push Worsening India's Jobs Crisis? India is continuing to push hard for start-ups and digital technologies in the hope that they will create more new-generation jobs. But is this strategy doing more harm than good for the ongoing jobs crisis? It is estimated that China creates 35,000 jobs a day. It has to, as even at that pace, which is 13 million jobs annually, the demand for jobs is still higher, at around 15 million a year. But instead of learning from China, India has preferred to look at Silicon Valley and West, to lofty concepts like digital and start-ups. The reasons for this preference are complex than thought earlier. For one, India had spectacular success starting in the early 90s with Western technologies like IT and IT enabled services, which coincided with the economic liberalization by then Prime Minister PV Narasimha Rao and Finance Minister Dr. Manmohan Singh. All Prime Ministers and their Cabinets since then including AB Vajpayee, Dr. Singh himself, and now Narendra Modi and his colleagues continued and still continues to believe that embracing the next wave of Western technologies like digital and start-ups would continue to deliver for India. Of course, there were detractors for computerization way back in the 90s themselves, notably the Communist parties of India. But their farsightedness didn’t deliver for them back then as the country even while embracing full-fledged computerization, managed to create a huge numbers of jobs in the IT sector. Even in a problematic year like 2009, with the brunt of the global economic crisis, that is how India added 1 million new jobs. Then, what is the difference between that wave of Western technologies that empowered Indian job pool and the current wave of digital and start-ups? The simple answer is that while the first wave of computerization was aimed at empowering individuals by making their jobs more efficient, this current wave is all about using automation for eliminating working individuals in the guise of serving consumers faster and more efficiently. Take India’s stronghold of services, for instance. Be it banking, retail, travel, trade, education, healthcare, or hospitality, we see that digital technologies employed by start-ups are basing their business model solely on automation. The massive push for digital transactions is ensuring that banks will need much less staff in the coming years. Further, the advent of cutting-edge fin-tech is seeing to it that jobs like insurance agents and brokers of financial products like loans, mutual funds, stocks etc are getting eliminated rapidly. The availability of tuition apps is eliminating the need for tuition teachers. The ease of e-commerce sites like Flipkart has already hit retail jobs like a tsunami. The travel and tourism industry has also taken a hit as the traditional role played by travel agents are now done by travel portals and aggregator apps. Are any of these technologies bad? Of course not. Is it bad for India? Again, no. But should these be priorities for India? That is where the problem lies. China is far ahead of us in almost all these technologies, but there is a cardinal difference there. Our neighbour is not as dependent as us on the services sector, as it has one of the world’s most thriving manufacturing sectors. Secondly, it makes for the whole world by pushing its own brands, where India is content with serving the world through IT services etc. That is where our priorities should have been and not on pushing technologies like digital and initiatives like start-ups which thrive on automation and elimination of jobs in our only major sector of services. Take the case of the world’s most valuable start-up, Uber. Unlike many other start-ups in the banking, fintech, travel, e-commerce etc, the ground-breaking taxi-hailing service hasn’t caused loss of many jobs. But that is just for now. Uber’s eyes are solely set on the horizon of driver-less cars. And it is racing closer to it than most consumers and governments imagine. Indeed, the acceleration in driver-less car technologies is pushed not just by tech or auto companies but by direct beneficiaries, the giant taxi-hailing services of the world like Uber. So, what will happen to all these drivers? Their jobs will get eliminated, first in the advanced markets like North America, Europe and Japan, and then in developing markets like in Asia and Africa. That is, if governments do nothing about it, and embrace that too as the next great wave of Western technology. There is also another angle to the mindlessness or senselessness with which start-ups like Uber will eliminate jobs if given a free run, which is a point many less aware governments miss. They are not your ancient entrepreneurial monopolies like Ford, Apple, Microsoft, Google, or Infosys where there was a dominant entrepreneur or co-promoters who took pride in huge tech work-forces and out-of-this-world HR policies and stock options. Rather, the new breed of massive digital start-ups is characterized by owners that are some of the world’s largest institutional investors. An innovative entrepreneur just starts the game, and if it is disruptive enough to be scalable, cutthroat PE funds flock in and scale it beyond imagination, thereby taking down the entrepreneur’s equity and even full elimination of his role. Again, Uber is the classic example. A Canadian innovator named Garrett Camp who invented the once ambitious Google rival StumbleUpon comes up with a second brilliant idea – an automated taxi-hailing service. He and two other friends build the first prototype. They bring in another innovator, Travis Kalanick, founder of peer networks Scour and Red Swoosh as an advisor, who also happened to be sitting on significant cash due to successful sells of his start-ups. Co-founders Camp and Kalanick invested 2 million in seed money and the rest is history. Institutional investors of all hues started to flow in starting from Benchmark, Google Ventures, Baidu, Toyota, Saudi Arabia, Sequoia and finally the mother of all institutional investors now – Japanese major Softbank – which calls the shots now at the world’s most valuable start-up, valued at $72 billion now. An ugly fight for control between co-founder and then CEO Kalanick and early institutional investor Benchmark in 2017 resulted in his ouster as CEO, and emergence of Soft Bank as the largest investor with 18% stake. In contrast, Garrett Camp who continues as Chairman controls only 5% stake and Kalanick who continues as a Director controls only 7% in the company they founded. Including the stake of Softbank, institutional investors hold 88% of Uber’s equity. And it is no wonder, as Uber is yet to turn in a dollar as profit. In 2017, Uber had a staggering revenue of $7.5 billion, but a devastating loss of $4.5 billion, with growth in loss more than double of growth in revenue. And Uber has just 12,000 employees worldwide. That is each employee is responsible for generating $0.63 million a year in revenue. It is the dream of institutional investors, as such models drive in further investments at higher valuations until everything is offloaded to the public through an IPO. This is the best digital and start-up model available in the world. It is best because it has still not eliminated jobs on a large scale. Other models like e-commerce and fin-tech fare even worse in eliminating jobs through automation. And this is just automation. The hit from artificial intelligence is still to arrive. Nobel prize winning economist Paul Krugman recently warned India, “There is this concept called artificial intelligence that you should be wary of. In future, while diagnosis may be outsourced to a doctor in India, it could also go to a firm based on artificial intelligence. Things like this could be a cause for worry for Indian services sector." It is high time India decided what we should prioritize – foreign direct investments from the likes of Uber, Amazon etc or incentivizing job creation. Whether it should be GDP growth or jobs growth. The situation is that dire. Recently, Indian Railways called for ‘un-glamorous’ and so-called blue-collar jobs like engine drivers, signalling staff, welders, porters, track maintenance workers, electricians and mechanics, with salaries starting from just Rs. 18,000 a month. There were 90,000 vacancies but the problem is that 2.5 crore youth applied, that is more than 277 times. And despite more than 62,000 of these jobs requiring only 10th grade pass, applicants were postgraduates, engineers and graduates. A recent study by KLEMS, in which India’s RBI participated for the country, showed that far from more jobs being created, employment has actually contracted during the previous two fiscals. Both Central and State Governments are cutting their new job creations, while nothing much is being done to spur private investment, as the main corporate financiers – the public sector banks – are reeling from NPAs. Any other nation, especially ones like China or US, would have long back ago solved the NPA crisis in a proactive, non-partisan way that rises above petty politics. But here only the slug-fest and the one-upmanship continue.